In Perugia, I lived in an apartment with big windows and cold floors. My flatmates would force slippers onto me when I walked around barefoot in the morning. Then they would make me coffee, and in the evening, spaghetti. Sometimes pasta twice a day. Around this time of year, November December, we might just have roast chestnuts and vino novello for supper. One of them – I can’t remember which one – used to leave the skin of tangerines, peeled in one long strip, on top of the radiator. So that the house would smell like citrus. Which reminded me of the passage below, from M.F.K. Fisher. I discovered little dried sections of tangerine. My pleasure in them is subtle and voluptuous and quite inexplicable. I can only write how they are prepared. In the morning, in the soft sultry chamber, sit in the window peeling tangerines, three or four. Peel them gently; do not bruise them, as you watch soldiers pour past and past the corner and over the canal towards the watched Rhine. Separate each plump little pregnant crescent. If you find the Kiss, the secret section, save it for Al. Listen to the chambermaid thumping up the pillows, and murmur encouragement to her thick Alsatian tales ofl’intérieure. That is Paris, the interior, Paris or anywhere west of Strasbourg or maybe the Vosges. While she mutters of seduction and French bicyclists who ride more than wheels, tear delicately from the soft pile of sections each velvet string. You know those white pulpy strings that hold tangerines into their skins? Tear them off. Be careful. Take yesterday’s paper (when we were in Strasbourg L’Ami du Peuple was best, because when it got hot the ink stayed on it) and spread it on top of the radiator. The maid has gone, of course – it might be hard to ignore her belligerent Alsatian glare of astonishment. On the radiator the sections of tangerines have grown even plumper, hot and full. You carry them to the window, pull it open, and leave them for a few minutes on the packed snow of the sill. They are ready. All afternoon you can sit, then, looking down on the corner. Afternoon papers are delivered to the kiosk. Children come home from school just as three lovely whores mince smartly into the pension’s chic tearoom. A basketful of Dutch tulips stations itself by the tram-stop, ready to tempt tired clerks at six o’clock. Finally the soldiers stump back from the Rhine. It is dark. The sections of the tangerine are gone, and I cannot tell you why they are so magical. Perhaps it is that little shell, thin as one layer of enamel on a Chinese bowl, that crackles so tinily, so ultimately under your teeth. Or the rush of cold pulp just after it. Or the perfume. I cannot tell. We often used frozen raspberries in the bakery, especially when they are going to be cooked down to make puree. They still have a lot of flavour. The first time I made this I used the whole peel but because of all the pectin in it, the results were quite stiff. Just use half, put the other half on the radiator. Sterilise your jars. (Since I don’t have a dishwasher, I fill them with boiling water.) Put some spoons in the freezer for testing. It is a small quantity of jam, so it can be made either on the stove or in a microwave. If you try the latter, keep an eye on it as it sets quickly. Heat the raspberries gently to defrost. Blend half the tangerine peel and all of the pulp (remove seeds first) with a spoonful of the sugar to make a puree. 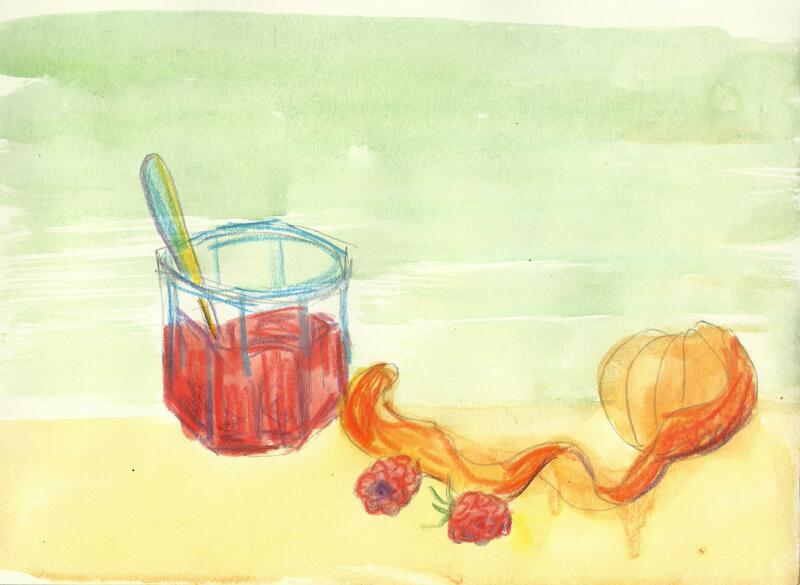 When the raspberries have softened and started to liquefy, add the tangerine puree and the rest of the sugar. Bring to the boil and let it bubble for about 5 minutes. The bubbles should sound a tone deeper, the mixture more syrupy than before. When you drag the wooden spoon across the bottom, it should take a second for the liquid red sea to come back together. If in doubt, test the consistency on a frozen spoon: when the jam is at room temperature it should hold its shape instead of sliding quickly over the spoon, it should form a slight skin that will wrinkle slightly when you push it. You will see the jam sticking around the edges of the pan and on the wooden spoon too. * Carefully pour into jars, to the brim, close and turn upside down to cool. *Plagiarising self from last post about jam. What a lovely post, Frances. It made my mouth water, and I could smell the citrus! I will have to try this recipe. My brother once made me mandarin “dust” from dried mandarin skins, from his own mandarin trees. It was beautiful sprinkled on yoghurt with with fresh strawberries. I will check with him how he dried it and let you know. Oooooh mandarin dust! And I never get tired of “things to sprinkle over yoghurt” especially as my flatmate makes her own now. Merry Christmas Ruth! This was beautiful to read, thank you. I can smell tangerines now! I love the smell of citrus!